An unidentified and unidentifiable Claughton in the usual place for official photographs alongside the paint shop at Crewe Works on October 26th 1926. The engine is newly painted in plain black with the LMS roundel on the cab side and cannot be identified as the number is on the tender and front numberplate, neither of which can be seen. 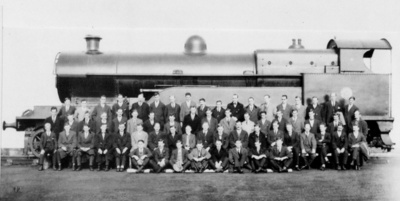 But what is the occasion and who are the men posed beside the engine? According to Baxter, only two Claughtons received their LMS livery in October 1926.
no. 5959 (unnamed) which had an ROD tender. The engine in the photo is in Livery Code C7 - black with LMS roundel, as applied to quite a few engines circa 1926, but neither of these two is recorded as ever having had that livery. That is not to say that they never carried it, however. Both were definitely red later on. I will put my money on no. 5959. Black from 1926 to say 1929, then red until withdrawal in 1932. I may be completely wrong here, but the Crewe Negative Register at the NRM lists just two photos taken on October 26th 1926. Unfortunately I can't read the entry with certainty. I think it says "Group of shed mutual improvement class secretaries", which sounds plausible except that the word secretaries seems wrong in that context. The 'group of shed mutual improvement class secretaries' title is very plausible. There were MICs at most of the sheds and each was formally organised with a Chairman/President and Secretary etc. Although more research would be needed to ascertain the reason for the group photograph in front of the Claughton, it is likely that this was an occasion of their annual conference. The LMS Magazine for January 1937, for example, has a small article on the 'Annual Conference of Western Division Class Secretaries'. This was held at Crewe on November 17th 1936, and so perhaps indicates there had been a similar occasion ten years previously. MICs were an important aspect of training for footplate staff, originally created by the men themselves (members of a growing ASLEF in the late 1880s) as a means of self improvement. This was eventually supported by the railway companies, which is not surprising as they realised they were getting their staff formally trained at no or very little cost to themselves. Most employees today would expect to be paid to attend training sessions funded by their employers - how times have changed. The MIC is an often overlooked and neglected area of railway history.